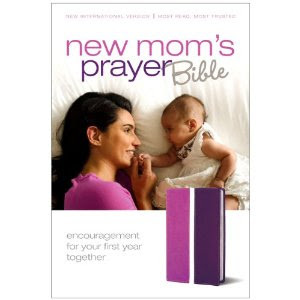 If you have a Protestant friend or family member who is expecting or recently given birth, The “New Mom’s Prayer Bible” would make a lovely gift. It can be so hard to focus on one’s spiritual life during those sleep-deprived emotionally exhausting days of early motherhood. Time to pray and do spiritual reading is at a minimum. This New International Version of Scripture is designed with the busy mom in mind. Interspersed throughout the pages of the Bible are several inserts – each of which focus on four topics. For example, a few of the topics included are Restoring Relationships, A Dose of Kindness, Enduring Pain, and Storms of Life. Each topic includes a 1 minute, 5 minute, and 10 minute option to reflect, pray, and study that topic. Other features of this Bible are a concordance, maps, and 5 minute reading plans. It has a soft leather cover which makes it pleasurable to hold and allows it to open flat. While it is advertised as a “New Mom’s Bible,” this Bible would actually be perfect for any busy woman seeking to add more Bible reading into her life. The word vocation means a “call.” In Catholic circles, it refers to a call from God. Many women receive a call from God to motherhood. It is a noble call, a challenging call, a call that will frequently bring a woman to her personal limits and to her knees in prayer. Yet, it has immense rewards. Those of us who have been called to this life should be both thankful for and humbled by it. Given that it is such a hard job, motherhood should be supported by all of us, in all its forms. Unfortunately, this is not always the case. While the outside world may be very supportive of working mothers, in Catholic circles, it is often seen as a “lesser” choice. If a mother “needs” to work, then it is acceptable, but even then I’ve heard other mothers say that they feel sorry for these mothers. The woman who chooses to work? She is frequently portrayed as selfish and not putting her family first. It is as if there is one version of motherhood that is held up as the ideal – the stay-at-home totally dedicated mother (if you managed to nurse exclusively for at least a year, homeschool your children, and have four or more children, you get extra points) – and all the others fall a little short. As a homeschooling stay-at-home mother, I am begging people to reconsider that position. I believe that I have been called to my current way of life for this season of my life. It certainly wasn’t in the life plan that I had for myself. Rather, God led me here. I am very fortunate to be able to work part-time from home. My situation was different in my past, and it may be different in my future. I hope to always do what God wants from me. Is it then possible to believe that others are called to different forms of motherhood? I would argue that it is. 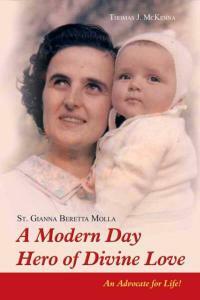 Learning about St. Gianna Beretta Molla (1922-1962) expanded my own understanding of the vocation of motherhood. She is a patron saint of working mothers. She was an accomplished physician who loved her work. She truly felt called by God to be a doctor. She continued to maintain her own practice while having three small children. St. Gianna would ultimately give up her own life so that her 4th child might live. That child followed in her mother’s footsteps and became a doctor herself. On the subject of vocation, St. Gianna wrote “What is a vocation? It is a gift from God, so it comes from God. If it is a gift from God, our concern must be to know God’s will. We must enter that path: If God wants, when God wants, how God wants.” God called St. Gianna to be both doctor and mother. She served God completely in both roles. On a related note, Pope Benedict XVI recently stated that “it is necessary to concretely support motherhood, including guaranteeing professional women the possibility of balancing family and work. Too often, in fact, women are put in the position of having to choose between the two.” He encouraged governments to support maternity rights, including child-care centers. God calls mothers to different forms of motherhood. Women should always pray to do God’s will in their lives. At the same time, all mothers should be supported and encouraged in their vocation, whether that vocation involves being a stay-at-home homeschooling mom, working full-time outside the home or any of the variations in-between. There is no one right way to be a mother. The only right way is what God is calling a mother to do at a given moment of her life. At the canonization of St. Gianna Beretta Molla, Pope John Paul II stated “The extreme sacrifice she sealed with her life testifies that only those who have the courage to give of themselves totally to God and to others are able to find fulfillment.” St. Gianna, who lived from 1922 to 1962, was a woman of our own time. A physician, she was a working mother who lived a life of service to her family and her community. In the booklet “St. Gianna Beretta Molla: A Modern Day Hero of Divine Love,” Thomas J. McKenna provides a brief biography that will help introduce readers to the life of this modern day saint. Raised in a devout Catholic family, she was devoted to Christ and the Church from her earliest days. As a teenager, she was deeply affected by attendance at a retreat based on the Spiritual Exercises of St. Ignatius of Loyola. Soon after, she became active in the Catholic Action movement, “a lay spiritual movement that helps its members follow Christ by emphasizing prayer, service, and sacrifice.” She chose to study medicine because she felt it was the best way she could help people in both body and spirit. She would ultimately choose to specialize in pediatrics. She always felt that her role as a doctor was a calling from God. She was an active woman with many interests, among them painting, music, and mountain trips. In 1955, she married Pietro Molla and devoted herself to Christian marriage and motherhood. She gave birth to three children in quick succession, and then suffered two miscarriages. In September 1961, she was expecting her fourth child when doctors found a large fibroid in her uterus. She was given three choices: remove the tumor, the unborn child, and her uterus (the only sure way to save her life); remove the tumor and the unborn child; or only remove the tumor. Even though she knew it was the riskiest course of action, she chose the last option and instructed her husband that if he was forced to choose between herself and the child, to choose the child. April 21, 1962, Gianna Emanuela was delivered via Cesarean Section. After suffering for a week, St. Gianna died on April 28, 1962 at the age of thirty-nine. This booklet also contains excerpts from St. Gianna’s own writings which allow readers to get real insight into her thoughts and observations, as well as a collection of prayers to ask for St. Gianna’s intercession. Brief, easy to read, and full of information, “St. Gianna Beretta Molla: A Modern Day Hero of Divine Love” is a wonderful introduction to the life and spirituality of this saint. “Sharing the Tradition, Shaping the Future” is a 2001 publication put out by the United States Conference of Catholic Bishops. Designed to be used by small faith-sharing groups over the course of seven weeks, the introduction states that the group “can explore how these basic [Catholic social] teachings affect our individual lives. With the Holy Spirit as a guide, the group can come to new understandings about how to further the work of the reign of God. . . The work of social justice is not the work of a few ‘experts.’ It should affect the lives of all.” The Bible Study I belong to is currently making its way through this text. The text is good. It is all based in scripture. It offers much food for thought on social responsibility and on how we treat those we perceive as different or less fortunate than ourselves. The challenge comes in with the “suggested actions” at the conclusion of each chapter. The actions are all extremely time consuming. For example, week one suggests “Join your parish social action committee. If your parish doesn’t have one, start one.” Week three offers the following: “If your community has a project to build or repair low-cost housing for the poor, volunteer some of your time. If it does not, find out how you can initiate such a project or a similar project.” All of us in this Bible Study are homeschooling moms. Many of us also work outside the home in some capacity. There are only so many hours in one day. Even a single person would be hard-pressed to complete more than one of these projects, never mind one each week! Looking at the world’s problems, we can easily become discouraged. After all, they seem so big, and each of us has limited resources. Faced with suggestions like those in this book, one’s discouragement only increases. I do believe that community service is extremely important. Each one of us is called to reach out beyond our own families and friends into the world at large. Different stages of life call for different forms of community service, however. Yes, there are moms who manage (somehow) to make huge contributions to the world while successfully raising their children. Perhaps God called them to this special form of service. Most of us, however, are called to minister in smaller, if not less important, ways. Mother Teresa offers great encouragement to those of us who find our lives centered mostly on our families. She stated that one of the most important things is for us “to do small things with great love.” Each one of us is capable of that. We can make a difference in small ways, beginning with our families, our friends, our neighbors, and the communities we live in. We can treat people with respect and kindness, give charitably what we can, share what we own, and extend hospitality to others. We can volunteer where and how we are able. We can trust in the ripple effect, that each act of kindness will lead to others. We can (and should) do what we can and trust that God will do the rest. “So be perfect, just as your heavenly Father is perfect.” (Matthew 5:48) Perfection. Every woman I know strives for it and comes up woefully short, myself included. We want to be perfect wives and mothers, to be successful in our work, have clean homes, pray as much as we should, be good friends, exercise and eat right. In Catholic circles, especially, we often strive to be like Mary. We hold her up as our model which is as it should be. Yet, maybe, we shouldn’t be quite so hard on ourselves when we don’t quite measure up to that standard. After all, we believe Mary was sinless. She may have been tempted, but she never failed. She had an unlimited store of God’s grace which never let her down. We, on the other hand, have the burden of sin. We make mistakes. We screw up. We fall down. We hurt others and get hurt ourselves. We don’t always forgive others the way we should. We are not always patient and loving. We have to get up every day and face the consequences of our failures. It’s enough to make me want to pull the covers up over my head and stay in bed . . . permanently. I like Webb’s definition of perfection – “to be committed to growth and completion.” It means that I and all my fellow sisters in the trenches are works in progress. It changes the standard by which we judge ourselves. Maybe we haven’t reached the pinnacle of our development, but we are all growing. We are all trying to move along the right path, to grow closer to God and to do His will. Yes, we screw up, but maybe the mistakes help us to grow as well. We want to be complete, but it will take a lifetime to get there. In the meantime, we can keep trusting that we are making progress. It may be the two steps forward, one step backward kind of progress, but it is still moving forward. We can also enjoy life as it is. We can accept our imperfection. We can accept that we are not God. We can accept that it is not in our power (nor is it our job) to make everyone around us happy all the time. We can trust that God knows what He is doing, that He can use us in spite of our failings. We can lean on God through it all. His perfection will carry us through. I think that one of the hardest things about being a Mom is the realization that I am no longer only responsible for my own soul. I am also accountable for my children’s souls as well. I have to teach them right from wrong and how to make good decisions. I need to teach them how to pray and how to lean on God always. I must show them what is important in life. I also need to help them know what to do when they make a mistake. My sons are young (nearly nine and seven), but are growing up quickly. These are their prime formative years. They are like little sponges, absorbing everything they are exposed to. They are very concerned with what is good and bad, and what is “medium” – their term for something moral-neutral. They both have made their 1st confessions and now attend that sacrament on a regular basis. They are concerned about sin and doing what is right. I never thought that I would be called upon to make a moral determination about almost every action they make throughout the course of a day. Some days, it is truly exhausting. Yet, I realize the importance of it. If they are going to have a well-formed conscience, it is up to me to help make it that way. One of my friends commented recently that the only thing she got from attending Catholic school was a conscience. I told her that wasn’t a bad thing to get. Yes, sometimes having a highly-formed conscience can seem like a burden. Wouldn’t doing what we want without those feelings of guilt make life so much easier? It seems like that is how most of the world operates. Aren’t they the ones who are truly free, the ones who get to enjoy life? No, it only seems that way. It is evil’s illusion. The Catechism of the Catholic Church states that “The education of the conscience is a lifelong task. From the earliest years, it awakens the child to the knowledge and practice of the interior law recognized by conscience. Prudent education teaches virtue; it prevents or cures fear, selfishness and pride, resentment arising from guilt, and feelings of complacency, born of human weakness and faults. The education of the conscience guarantees freedom and engenders peace of heart.” (CCC 1784) We will be happier in the long run if we both learn and do what is right. The choices aren’t always easy. The guilt when we act in error can be huge and long-lasting. Yet, it is much better than the alternative – living without a moral compass. Forming conscience is a long-term project. My children will not know what to do in every case by the age of ten, or fifteen, or even twenty. Yet, I must do my best to give them the tools to make the best decisions they can in light of God’s direction. It is the same thing I strive to do in my own life (while acknowledging that I sometimes fail). It is an awesome task, but one that every Catholic parent must take on. 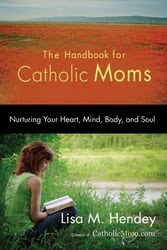 Reading The Handbook for Catholic Moms: Nurturing Your Heart, Mind, Body, and Soul is like having a warm and inviting conversation with a group of your closest Mom friends. Lisa Hendey, founder of CatholicMom.com, shares her own wisdom garnered from 18 years of parenting, as well as the collected wisdom of the Catholic Mom community. “The Handbook for Catholic Moms” offers concrete advice on all of these topics. The suggestions are based on real-life experiences. For each topic, Hendey offers personal stories and counsel from other Catholic moms (I was honored to be among those invited to offer a reflection). Each chapter features “Mom’s Homework” which includes suggestions on action steps one can take to work on the issue under discussion. There are also web resources for further information. “The Handbook for Catholic Moms” is the perfect resource for moms at all stages of their parenting journey. You will find yourself nodding in agreement, laughing at some of the stories and tearing up at others. You will gain important kernels of knowledge you can put to use. Most importantly, you will feel encouraged in your vocation as a Catholic mother. Sundays Exist for Moms, too! Each week, Sunday is meant to be a time of celebration, a mini-Easter, an opportunity to worship and rejoice and rest! How lucky we are! Yet, sometimes, we do not view it that way – especially we moms who never actually get a day off. Sundays simply result in a different set of duties. Even going to Mass can be a struggle. There is the effort of getting everyone up and out of the house (sometimes with considerable protestations). Then, there is the challenge of keeping everyone quiet and well-behaved in Church. Anyone who has experienced Mass with a crying baby, screaming toddler, or antsy preschooler can relate. Mass can be the most stressful hour of the week! Yet, it is still important to go. The Eucharist feeds our soul, giving us strength for the week ahead. Sunday does invite us to dedicate more time to God and to our own rest as well. It is meant to be pleasant and to provide the opportunity to do things and see people that bring us joy. Moms may need to make a special effort to get that rest. It most likely isn’t going to be an all-day experience, but if we can grab an hour or two to engage in some activity that refreshes us, a recreation that truly re-creates us so that we can approach our familial responsibilities with a lighter heart, both we and our families will be better as a result. That activity may need to take place Saturday night (technically part of the Sunday celebration) after the children are in bed, or early Sunday morning. There is time, although at first it may be a struggle to find it. Soon, however, it will become a routine and something to look forward to each week! God wants us to rest and enjoy His day. We need to worship and we need to celebrate. Sundays exist for Moms, too! He knows we need them.